It looked like Dale Earnhardt, Jr. might finally break free of the years-long slump he'd recently emerged from, but a couple of hard hits to the wall appear to have crushed his chances. He walked away from a 25-car pileup at Talladega Sunday, but has since been diagnosed with a concussion, taking him out of the next two NASCAR races. Watching NASCAR at Talladega is like watching cars in a traffic jam for three hours. Since he was able to drive away from the crash, medical treatment wasn't required. But after last weekend's wreck, Earnhardt said he wouldn't compete at Daytona or Talladega anymore, calling restrictor plate racing "bloodthirsty." He had also slammed into the wall in Kansas when his right front tire blew out, although no one knows if he sought medical attention afterward. NASCAR has required medical clearance — consisting of MRIs and CT scans — for concussed drivers since 2002, when a concussion Earnhardt suffered in a California race made it difficult for him to concentrate. Thus Regan Smith will drive the No. 88 Chevrolet in Charlotte and Kansas. 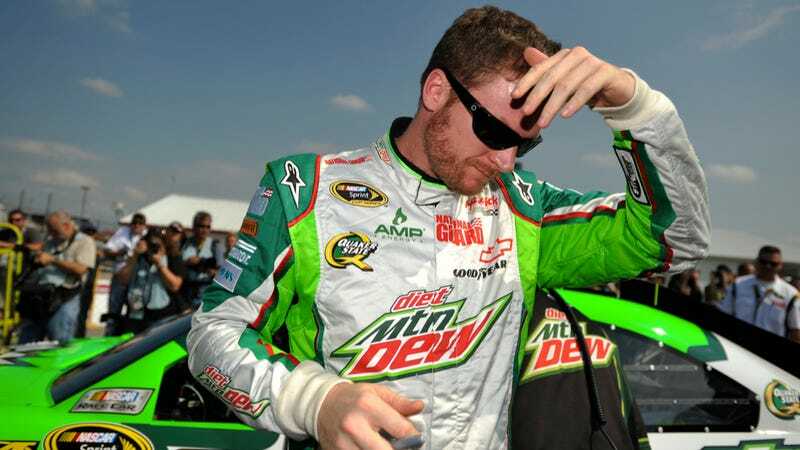 UDPATE: Dale, Jr. held a press conference where he explained what led to this decision.